In Northern California the bike racing seasons overlap so much ( Road from New Years Day through late Sept, Track from March through Oct, plus off season racing, and CX from Labor Day through January, not even counting MTB season thats an animal of its own) it can be really tricky to create rest periods for the stoked racer. I have to really encourage stepping away from structured training for most riders for the mental benefits more than the physical cost. As a former 75 race a year guy I understand how fun it is to live the lifestyle, but also know that most AG athletes pile a huge race season onto a demanding work/school schedule. So we need to build in short breaks! That being said, using racing outside of our normal focus is a fantastic sharpener, both fitness wise and skills wise. 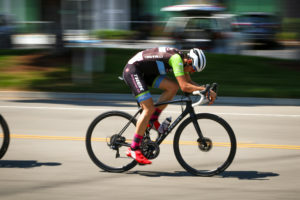 Track racing for intensity and skills, mtb for bike handling and pure power, cx for fitness in a fun way in the winter, and crit racing for pack awareness, learning to read a race, and high end speed and power. Note this scatter plot from last weekends crit champs in Norcal- Tons of high cadence and power across the board with very few lower cadence points. This is FANTASTIC work for 40-60 min and super hard to recreate indoors or with standard intervals. I had two riders at this race, one scored a silver medal in her AG and one a 4th place pulling the chase group around for 48 minutes. More importantly she got in some great work prepping for UCI Track Worlds and he got in some solid riding prepping for the start of his first year in the U-23 CX races. Put some thought into how to find SPEED in your training when the group rides go away but the goals are still there! And take breaks! You’ll be faster in the end!